Dale Strochein was right! The bass bite was on fire! A few years ago I made an early May trip to Door County, Wisconsin for a couple days of fishing. I was slated to fish with several of the top guides that work the area. Though a salmon fisher at heart, I learned long ago to let "guide’s choice" be the order of the day. If the man says perch, don’t say bluegill. If the guide says striper, don’t argue for bluefish. So when J.J. Malvitz, new to the guiding business but a lifelong Door County resident and fisherman said, walleye, so we went walleye fishing. The waters of Green Bay on the west side of the peninsula have a reputation for serving up walleye to visiting anglers, numbers at times and most certainly good sized specimens. Perhaps I should have asked J.J. to go brown trout fishing. The walleye prevailed, we were skunked. 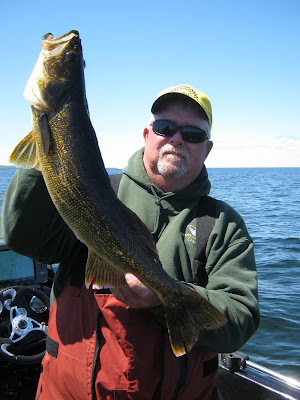 My next trip was with Dale Strochein, once one of the top professional tournament walleye fisherman on the circuits, now proprietor of the Wacky Walleye Guide Service working out of Sand Bay Beach Lodge just south of Sturgeon Bay. I guessed guide Strochein would say, "walleye." Wrong! Captain Dale said, "Conditions aren’t right for walleye. We’ll fish smallmouth bass." I should have, could have, demanded walleye despite the guide’s wishes. The results would have been the same. Obviously, no walleye and no bass, either. He blamed it on the weather. I blamed it on the weather as well. It was miserable. "Come back again, sometime," Dale invited. I watched Strochein’s FaceBook posts that winter as he showed picture after picture of him and his clients icing big walleyes and piles of whitefish. I checked my calendar, he checked his and a date was made a week or two later. This time Strochein’s prediction was half right. "We’ll catch whitefish this afternoon, then towards sundown, the walleye will get active and we’ll go after them." I finally nailed a mythical Green Bay walleye. Twenty seven incher! On the way in after dark, I mentioned something about Green Bay’s walleye seem to be somewhat mythical. "Are 12 or 14 point bucks mythical?" he asked and continued. "No, of course not, but they aren’t easy to come by, either. Our walleyes are trophy fish, they don’t come easy. Come back again sometime and I’ll show you. Yesterday, I came back. That evening at dinner the Hall of Fame angler said, "We’ll fish smallmouth tomorrow. That’s our best shot at success." My reply, "There goes my shot at the mythical, Green Bay walleye!" Dale was half right again. The bass fishing was terrific with one after another being hauled to the boat all morning. The wind died, the water calmed. "One last spot to try before we head in," Dale said. He stopped on a sunken rock island a mile or so off Sister Bay. A few casts later, I got a solid strike. This fish felt different. This fish looked different under the water. This fish was different. It looked almost mythical!